What impact do these findings have in the Punjab context? Why did you undertake this study? How will this report help clarify the historical record? How would this report help bring the perpetrators to justice? Haven't Punjab Police and government bodies already documented the number of people killed and "illegally cremated?" Why doesn't this suffice? If there is so much data available, why can't you make claims about the number of people killed by security forces during the Punjab counterinsurgency campaign? What are the future prospects for this work on the Punjab counterinsurgency? Will this analysis help locate the disappeared or reveal their stories? Do the families of the killed and disappeared support this analysis? What has been the impact of quantitative studies of human rights violations in other regions? We undertook this analysis in order to use systematic and verifiable quantitative research to clarify the historical record and reduce the deniability of the perpetrators, allowing for institutional responsibility. To date, this study is the most comprehensive, quantitative analysis of lethal violence during the counterinsurgency in Punjab. It brings together over 21,000 records compiled by the National Human Rights Commission, the Tribune newspaper, official state records, and local human rights organizations and initiatives. The available data have been analyzed using reproducible scientific methods and increase our understanding of "who did what to whom?," "where?," and "when?." The findings of this report interrogate the plausibility of the state's explanation and justification for mass cremations and "encounters," with alleged militants, as well as their claim that human rights violations were isolated incidents during the counterinsurgency. By using quantitative methods, this report demonstrates the implausibility of lethal human rights violations being "random" or "minor aberrations" as claimed by Indian officials. The findings further indicate that the intensification of coordinated counterinsurgency operations in the early 1990s was accompanied by a shift in state violence from targeted enforced disappearances and extrajudicial executions to large-scale and systematic lethal human rights violations, accompanied by mass "illegal cremations." Further, the report lays the foundation for additional research into specific areas of what happened during the conflict, who was disappeared and extrajudicially executed, and who is responsible for the violations that occurred. To date, state authorities in India have dismissed allegations concerning human rights violations during the counterinsurgency as "minor aberrations" and "random" events. This report brings together all of the currently available empirical evidence and shows that enforced disappearances and extrajudicial executions by the state were neither "minor aberrations" nor "random" events. Rather, enforced disappearances and extrajudicial executions were committed on a large scale in Amritsar district and there is evidence showing that these acts spread to the other districts of Punjab as the state's counterinsurgency operations intensified. Further, the pattern of enforced disappearances and extrajudicial executions is systematic and not consistent with the hypothesis that these were purely random events. This report brings new evidence to light contradicting the state's position that its policies and practices did not result in large-scale human rights violations. This report also complements existing legal and qualitative analyses on human rights violations in Punjab during the counterinsurgency and increases the quality and quantity of evidence available to the National Human Rights Commission and Supreme Court of India. This analysis clarifies the facts surrounding historical events that can help hold perpetrators accountable and develop appropriate institutional reforms of the security sector to ensure that these violations do not recur. This report, and future analyses which may arise out of this analysis, aim to introduce new evidence that the Supreme Court of India and National Human Rights Commission (NHRC) can use in their proceedings on justice and accountability for mass human rights violations in Punjab during the counterinsurgency. For example, in this preliminary analysis we have empirically demonstrated that security forces disappeared, extrajudicially executed, and secretly cremated individuals outside of Amritsar district. Amritsar has been the only district under review by the NHRC in the Punjab Mass Cremations case, but this analysis provides an additional basis for the NHRC and the Supreme Court to expand the review. By combining large-scale, empirical data and reproducible, scientific research methods, this work narrows the uncertainty around what happened during the conflict and reduces the scope for deniability by perpetrators. No institution or organization has documented the full-scale of lethal violence or "illegal cremations" that occurred during the Punjab counterinsurgency. Further, several issues undermine the credibility of estimates provided by government and security forces. First, quantitative analyses support qualitative findings that the Punjab Police extrajudicially executed innocent individuals and reported their deaths as encounter killings. Punjab Police released press reports almost daily to local newspapers, detailing the civilians, security forces, and alleged militants killed. Alleged militants were most often reported killed in encounters involving an exchange of gunfire. However, human rights groups have documented hundreds of cases in Punjab where victims were arrested, abducted, or executed by security forces in the presence of witnesses – but then would be reported a few days later as a "suspected militant," killed in an "encounter" with security forces. These reports suggest that many such reported encounters were falsified. So-called "fake encounters," in fact, were so prevalent that the practice has been remarked upon by the U.S. State Department and widely acknowledged in the media. Empirical findings from our report are also consistent with qualitative findings that reported encounters were often faked.Second, the state of Punjab has admitted to forging the identities of over 300 victims of "illegal cremations" in order to protect police collaborators. In February 2006, then-Director General of Punjab Police S.S. Virk admitted that the Punjab Police faked the deaths of over 300 accused militants-turned-police-informers who were then given new identities. Virk's confession asserted that 300 unidentified bodies of innocent victims were cremated in place of the police collaborators; these victims have yet to be identified by the police. Third, the Punjab Police has made at least one fraudulent identification to claim compensation. During the proceedings of the mass cremations case before the Bhalla Commission of Inquiry, a subcommission of the National Human Rights Commission of India, (NHRC), Ensaaf investigated five randomly-selected "illegal cremations" identified by the police. One of the identifications was fraudulent – a friend of police officials falsely reported an "illegal cremation," hoping to cash in on the compensation offered. The NHRC ordered the state, which had submitted this identification, to investigate this one incident, but rejected the request for independent investigations of all police identifications. Further, the Bhalla Commission continued to rely on police admissions without investigations. Lastly, the security forces, including the Punjab Police, are the accused perpetrators. Instead of investigating cases, survivors have accused them of thwarting investigations by intimidating witnesses and survivors, obstructing justice by harassing lawyers, and failing to comply with court orders, among other abuses. While there are a number of different sources that have collected information about the number of people killed by security forces in Punjab, each one of these sources, or data sets, alone is incomplete. In order to make scientifically defensible estimates of the number of people killed, we need to apply the demographic technique of multiple systems estimation to the available data. This scientific estimation method is used widely in adjusting for undercount in population censuses. In epidemiology, multiple systems estimation (MSE) is used for estimating the incidence of rare diseases from multiple registration lists of diseased people. More recently, multiple systems estimation has been used in large-scale human rights projects to estimate the magnitude of conflict-related mortality. Multiple systems estimation uses multiple data sets that estimate the size of a population being measured, by modeling the probability that different types of documented individuals in a population are included or excluded from a particular data set. Records in each data set need to be matched against records in all other data sets and assessed as to whether they represent the same or different individuals. From this record matching process, inclusion/exclusion probabilities are estimated and from that scientists can estimate the number of individuals who were never documented by any of the available data sets. Two main areas of future research into the questions investigated in this study include extending the analysis of existing data by matching and merging multiple, independent datasets. Additional collection of data on enforced disappearances, extrajudicial executions, encounter killings, and "illegal cremations" throughout Punjab is also needed. Together with qualitative data, our findings will provide evidence of the true magnitude and patterns of violence throughout Punjab, contributing to the debate about the impact of counterinsurgency strategies on fundamental human rights. This analysis helps to amplify the voices of the families of the disappeared and place their individual testimonies and affidavits in a larger historical context. The violations that have been analyzed took place at a time when the rule of law was suspended to permit security forces to "fight terrorism." As Ram Narayan Kumar states in his preface to the report, "With the methodological reliability of the compilation and analysis of events data, it becomes easier for all involved, irrespective of political dispositions, to see how they become socially responsible when the rule of law is suspended." This report breaks new ground in clearly showing that as the counterinsurgency operations in Punjab intensified, enforced disappearances and extrajudicial executions were committed on a large-scale and spread from a concentration in Amritsar district to almost all other districts of Punjab. 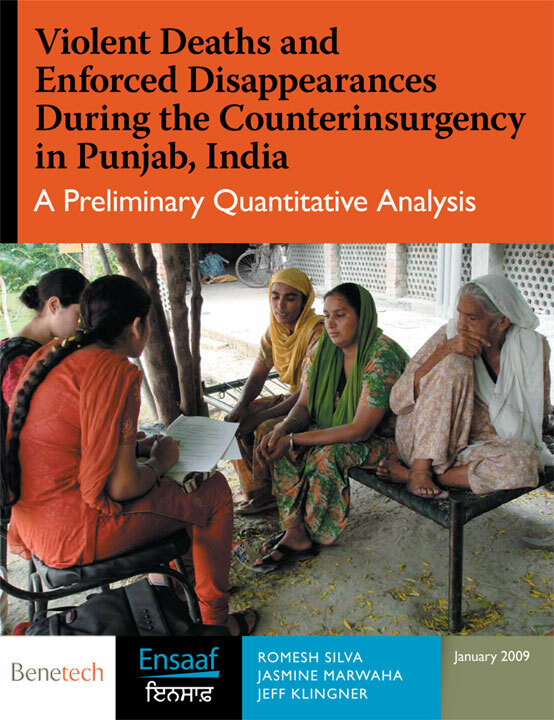 This preliminary, descriptive analysis lays the groundwork for additional analyses that will draw on inferential demographic and statistical methods to clarify the magnitude and pattern of all disappearances and extrajudicial executions during the counterinsurgency period in Punjab, including those that have not – or cannot – be documented. It is possible that this analysis will help locate information that will help determine what happened to people who were disappeared during this conflict, and it will support legal inquires that may pressure authorities into revealing the truth about this violent period in the history of Punjab. The police murdered both of my sons, and they won’t even admit that they did something wrong. They call my sons terrorists! The police are the terrorists.... The government should also give us copies of their records relating to the murder of my sons, so we can figure out what really happened. Quantitative analysis of conflict-related mortality during periods of political conflict has a long history. Since 1991, Benetech's Human Rights Data Analysis Group (HRDAG) has analyzed killings and other crimes in more than 17 countries in Asia, Africa, Europe, the Middle East, and Latin America. In Guatemala, HRDAG's use of multiple systems estimation helped establish that between 1960 and 1996 approximately 200,000 people were killed and disappeared. This analysis found that 94% of victims belonged to the Mayan ethnic group and that 98% of killings and disappearances were attributed to the state. This quantitative analysis, along with qualitative, legal, and historical analyses by Guatemala's Commission on Historical Clarification (CEH, by its Spanish acronym), contributed to CEH's official finding that the Guatemalan army committed acts of genocide against the Mayan people. At the International Criminal Tribunal for the former Yugoslavia in the trial of former Serbian president Slobodan Milosevic, HRDAG’s analysis of mortality and migration data helped to clarify the plausibility of explanations by Milosevic of why the conflict sparked a mass exodus of refugees. This analysis showed that the data were inconsistent with Milosevic's claim that people in the region were fleeing NATO bombing and also inconsistent with Milosevic's further assertion that people were fleeing atrocities by the Kosovo Liberation Army. HRDAG analysis clarified that there was strong association between acts of ethnic cleansing by the Yugoslav army and the spatial-temporal pattern of conflict-related mortality and conflict-related migration. In Peru, HRDAG’s analysis, which drew on data collected independently by multiple human rights organizations and the Peruvian Truth Commission (CVR, by its Spanish acronym), found that approximately 69,000 people were killed during the 1985–2000 civil war. HRDAG's estimate of the total number of people killed in the twenty-year conflict between government forces and Maoist insurgents more than doubled earlier, incomplete estimates. The analysis also revealed a stark difference in the way that people living outside the capital region were affected by the conflict, challenging the way many Peruvians understood their history. For example, the department of Ayacucho, in the Andean mountains, accounted for a total of 38% of the total estimated deaths throughout the conflict. Prior to the work by HRDAG and CVR, Peruvians had understood that most of the conflict had occurred in the Andean highlands. What most observers did not understand was the scale of disproportionality across space: there are more than fifty times as many people in Lima as Ayacucho, yet HRDAG and CVR found that there were approximately six times more killings in Ayacucho than in Lima. The relative risk of being killed in the civil war was more than 300 times greater for someone in Ayacucho than for someone in Lima.